Visit Patty Peck Honda, a premier Honda dealership serving Jackson to check out the 2014 Honda Civic Sedan. America’s best-loved sedan returned for 2014 better than ever, with subtle refinements all around for a more enjoyable driving experience. 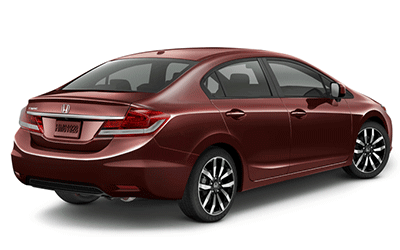 Jackson MS Honda fans may call us at 601-957-3400 to inquire about purchasing the 2014 Civic from our lot. The 2014 model kept the Civic at the head of its class. Reliability, safety, and fuel efficiency remain strengths of the Honda Civic as it celebrated four decades of excellence in 2014. Go further on a single tank of gas thanks to the CVT transmisison Civic’s get an impressive 30 City /39 Highway MPG rating. Equipped with a 1.8-liter i-VTEC® 4-cylinder engine, you’ll have an impressive 140 horsepower at your disposal. Behold state-of-the-art engineering technology that excels in fuel efficiency. Experience more aggressive styling as well as improved handling and braking performance. For 2014, Honda’s Eco-Assist increases efficiency in the Civic. The Eco Assist feature makes you more aware of your driving style, and helps you get the most out of the Civic. The first small car to earn the 2014 IIHS Top Safety Pick+ award, the popular Civic Sedan just keeps getting better. Advanced safety features for 2014, including the Advanced Compatibility Engineering™ body structure, Vehicle Stability Assist™ with traction control; an Anti-lock Braking System; side curtain airbags; dual-stage, multiple-threshold front airbags; and driver and front passenger side airbags. With a longstanding reputation for passenger safety and impressive efficiency for over forty years, Civic owners know what to expect when they step inside this award-winning sedan. 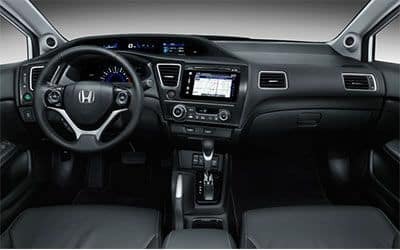 Discover everything the Civic has to offer, with its comfortable interior to its innovative technologies. The Civic continues to satisfy, and 2014 brings premium styling and an aggressive look. Inside, the interior has been given a facelift with softer materials used in the seats and headliner, while the dashboard and center console are highlighted by metallic accents. New user-friendly technology is now available for a more in-depth driving experience. Steering wheel-mounted controls let you easily access the functions of new tech features such as the intelligent Multi-Information Display and Bluetooth without having to take your hands off the wheel. Interested in driving home a Civic Sedan? Call Patty Peck Honda at 601-957-3400 for more information.